In celebration of Johnny Cash’s 80th birthday, Sony’s Legacy division has released a tributary live show (We Walk the Line) and a quartet of compilations covering his #1 hits, duets, country and gospel songs. The titles are cleverly punctuated (The Greatest: Duets) to suggest these are songs from one of country greatest artists, rather than definitive collections of the named slice of Cash’s catalog. And that’s a good idea, since reducing Cash’s greatest country or gospel songs to collections of fourteen titles is sure to engender argument. Instead, these collections provide a good sample of the riches in Cash’s enormous catalog. 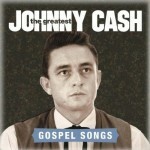 Cash was a musical omnivore who wove his personal tapestry from folk, country, rock and other genres. He was a musical historian who married into the Carter family he’d long-since revered, and a steward of tradition as a living thing, rather than a pedant who always colored inside the historical lines. The selections gathered here are about the songs and performances, rather than the records – only one of which (“Ghost Rider in the Sky”) – was a hit single. To Cash, these songs were warp threads in country music’s tapestry. And though he wrote many of his own country classics, the producers have focused on others’ songs that meant enough to Cash to garner a cover. 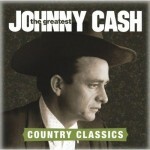 “Country Classics” is to be taken in the wide screen that Johnny Cash lived as an artist. The song list here includes foundational folk songs, historical epics, murder ballads, and numerous songs of romantic longing and heartache. The recordings stretch from 1960 covers of Hank Williams (“I’m So Lonesome I Could Die”) and Hank Thompson (“Honky-Tonk Girl”) to a 1984 recording of the Browns’ “The Three Bells.” Much like the titles on Rosanne Cash’s The List, these are songs that country music listeners should know; some famous, some obscure, but each one a piece of the colorful picture Johnny Cash painted with his career. 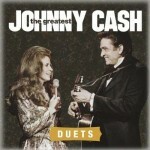 Friendship (or kinship) is a central theme of Johnny Cash’s best duets. These weren’t marriages of commercial convenience; they were instances of folk music’s most vital conduit. Cash was a singular musical figure, but one who drew widely for both musical inspiration and personal sustenance. Three of his four Top 10’s with June Carter Cash are here, as are duets with Cash’s younger brother Tommy, his musical fellow-traveler Bob Dylan, and fellow outlaws Willie Nelson and Billy Joe Shaver. 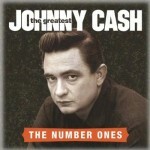 The selections are drawn from original albums, Cash’s television show, appearances on other artist’s albums and session tracks previously released as bonus cuts. The set includes liner notes from David McGee. The bulk of these selections are from the late 1950s through the 1960s, with only “Far Side of Banks of Jordan,” a duet with June Carter Cash, reaching into the 1970s. Many of these recordings aren’t really gospel; “gospel and country songs of faith” would be a more accurate title. Cash’s sanctified work from of the 1970s and 1980s can be found on the double-disc Bootleg Vol. IV: The Soul of Truth, but these earlier master recordings are a better musical spin, and provide a fine overview of material scattered across dozens of original singles and albums. This entry was posted on Friday, August 31st, 2012 at 3:13 pm	and is filed under CD Review, Reissue. You can follow any responses to this entry through the RSS 2.0 feed. Both comments and pings are currently closed.